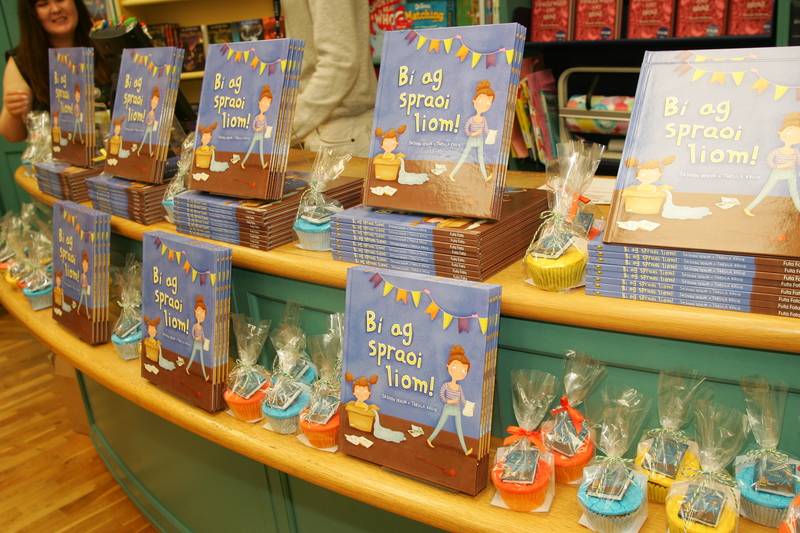 Bhí seoladh an leabhar nua Bí ag Spraoi Liom againn! Sin é! Tá mo chéad leabhar – Bí ag Spraoi Liom – seolta! Bhí seoladh álainn againn an Satharn seo caite i siopa leabhar Dubray i mBré. Dúradh cúpla focal deas faoi, briseadh buidéil seaimpéin air (not really) agus léigh me féin agus Tarsila le chéile é, le slua álainn a bhí bailithe le ceiliúradh linn. Rinne Joanna Fortune, an síciteripeoir clainne aitheanta, jab álainn den seoladh é féin. Labhair sí faoi cé chomh tábhachtach is atá sé do pháistí deis a bheith acu spraoi lena thuismitheoirí. Ansin thosnaigh sí ‘cotton ball snowball fight’ a rinne praiseach den siopa (!) ach a bhain gach uile duine a bhí ann – idir óg agus aosta – an-sult as. Ní bheadh sé ina cheiliúradh ceart gan císte áfach, agus bhí an t-ádh dearg linn go bhfuaireamar na cístí is áille dá bhfaca mé riamh ó Sweet Noni don ócáid. Féach na leabhair beaga orthu!! Ní hamháin go raibh cuma álainn orthu ach bhí siad an-an-bhlasta go deo. Bhí gach duine an-tógtha leo. Míle buíochas Giovana!! Bhí scuaine fada tríd an siopa de dhaoine ag lorg síniú uaim féin agus Tarsila ar a leabhair agus ba mhór an onóir dom deis a fháil labhairt le gach éinne agus fiú bualadh le roinnt daoine nach raibh aon aithne agam orthu fiú!! Mo mhíle buíochas le Tadhg Mac Dhonagáin ó Futa Fata as taisteal an bealach ar fad ó Ghaillimh le bheith linn ar an lá, le foireann iomlán Dubray a bhí iontach tacúil, le m’iníní a bhí chomh foighneach an lá ar fad agus le gach uile duine a tháinig le ceiliúradh linn. Ní dhéanfaidh mé dearmad choíche ar an lá! Mar sin… an é sin é? Tá an leabhar amuigh sa saol mór anois. Ní gá dom ach suí siar agus mo scíth a ligint, nach ea?! Faraoir, níl an obair ach ag tosnú is dóigh liom! 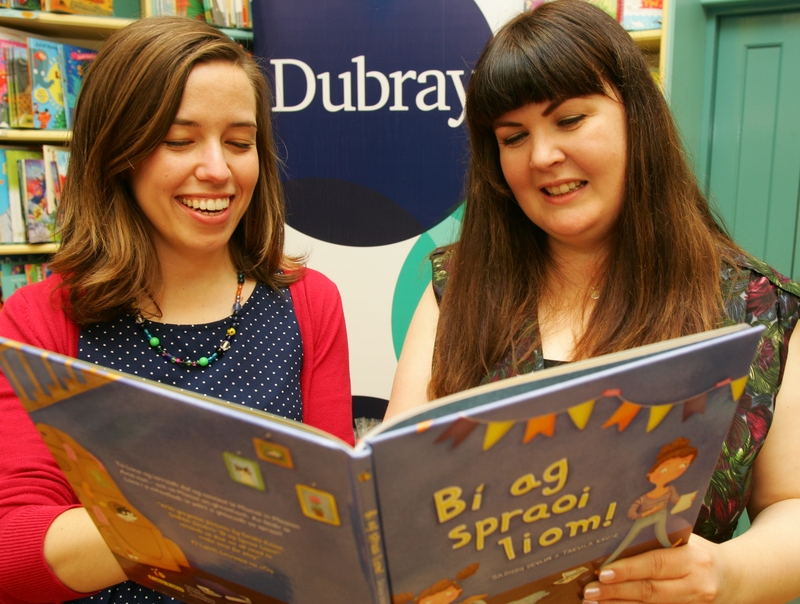 Ní hamháin go bhfuil orm leabhar a dó a chríochnú (ííííp!) ach tá neart imeachtaí ag teacht aníos a bhaineann le mo shaol nua mar scríbhneoir. Inné chaith mé lá an-thaithneamhach in Blackrock College ag labhairt leis na sluaite déagóirí mar gheall ar bheith i mo scríbhneoir mar chuid den Lá Litríochta a bhí acu. Ar an Satharn beag seo (7 Deireadh Fómhair 1-3i.n.) beidh mé i siopa Hodges Figgis ag ceiliúradh Bookshop Day agus ‘Books are My Bag’ (#BAMB) le Tarsila agus slua údair eile – msh Andrea Mara (The Other Side of the Wall), Linnea Dunne (Lagom), Peter Cunningham (Acts of Allegiance) agus Maite Lopez (At It Again). Má tá tú sa chathair bí cinnte bualadh isteach chugainn le bheith ag léamh, ag caint agus ag spraoi linn! Agus má thagann tú chuig an seastán againne, seans go ndéanfaidh Tarsila portráid a tharraingt díot! D’fhoilsigh Futa Fata an pictiúrleabhar álainn ‘Bí ag Spraoi Liom!’ le Sadhbh Devlin (údar) agus Tarsila Kruse (maisitheoir) i mí Lúnasa 2017. Ag an gceardlann seo, tar agus ‘bí ag spraoi’ le Sadhbh, a léifidh óna scéal nua do pháistí óga agus a dhéanfaidh ceardaíocht bunaithe ar théamaí an scéil ina dhiaidh. Mar chuid den Fhéile Litríochta Gaeilge IMRAM 2017 (www.imram.ie). Dírithe ar pháistí óna 3-7 mbliana d’aois. Bí ag faire amach ar mo leathnach Facebook faoi imeachtaí eile ata ag teacht aníos freisin!! Ní dóigh liom go mbeidh sos agam go ceann tamaill eile – agus níl brón ar bith orm faoi sin!